My son’s favorite way to color is with these heart shaped crayons. Since he has started school, he has become obsessed with coloring. The great thing about these crayons is that you can even use broken ones. Now, when your vigorous toddler accidentally breaks a crayon in two, you can make these. Using a very sharp knife, cut through the wrapper on each crayon length-wise and remove it. Break the crayons into small pieces, if they are not already broken. 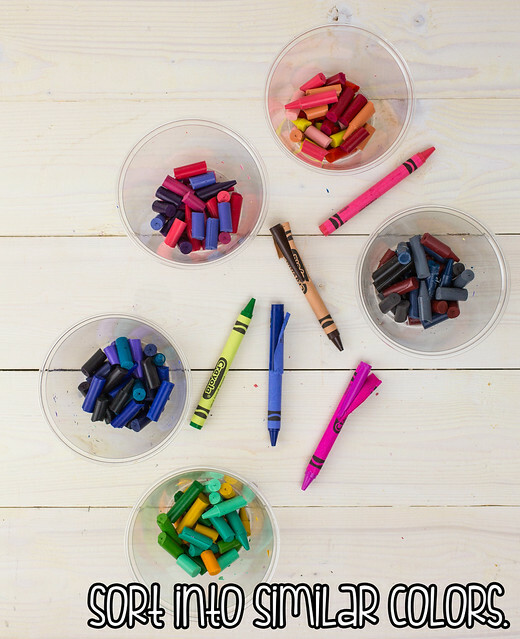 Sort the crayons by colors that will work well together — greens and yellows; blues and purples; and pinks and reds. 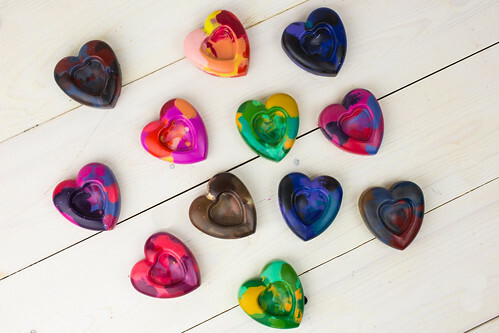 Fill each heart in the silicone mold with broken crayons. This mold was the perfect size, and I love the indentations of smaller hearts! Bake a 250 degrees F for 15-20 minutes until crayons are fully melted. Allow to cool and harden completely before removing from the mold. 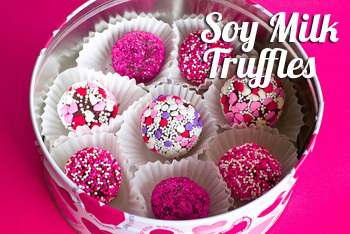 Want to make them extra-special? 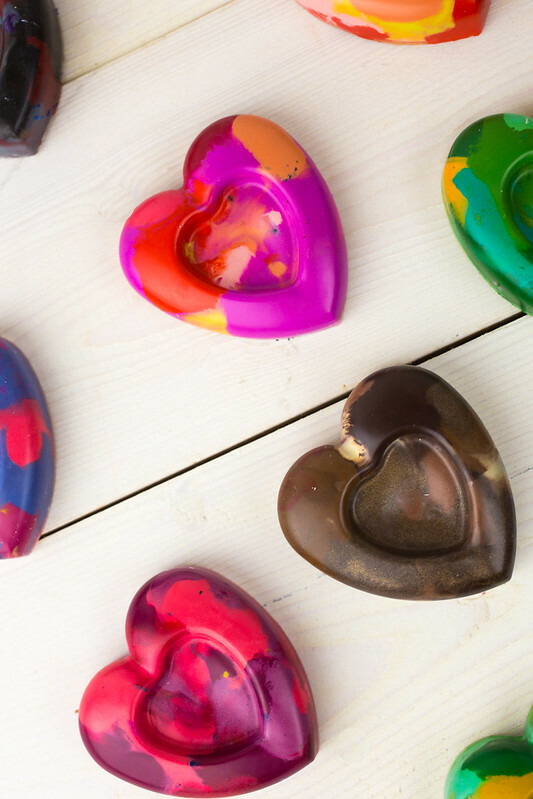 Add a few drops of lemon oil, citrus oil, or lavender oil to the melted crayons before allowing them to cool. This will make the crayons aromatic and enhance the sensory benefits of them! 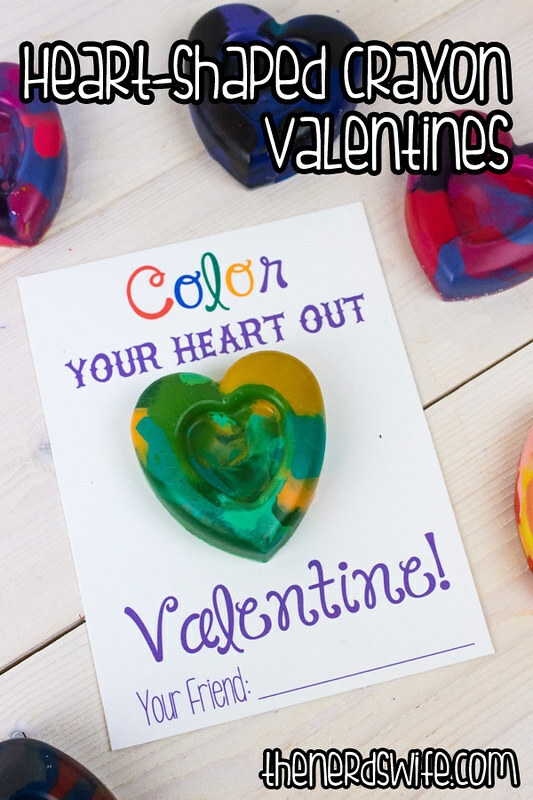 I attached the crayons to the Valentine’s Day cards using a drop of hot glue. I think they turned out really cute! How about some dinosaur crayons? I bet these LEGO bricks and LEGO mini figures would make awesome crayons! Some sea shell crayons would be awesome for a beach party. Or how about some adorable stars? Star Wars fans would love crayons made from these molds. These pony molds would make really cute crayons! 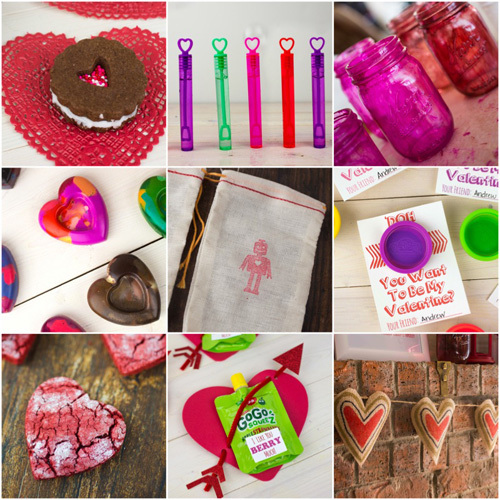 Don’t miss some of my favorite Valentine’s Day projects! Do you mind sharing what fonts you used for the cards? I love them! Hi Victoria! The words “Color” and “Valentine” are in Janda Happy Day, the words “Your Heart Out” are in High on Fire and the words “Your Friend” are in KG Call Me Maybe Skinny. Hope that helps! I used white cardstock to print the cards. I would say these are perfect gifts for children ages 2 and up — anyone who likes to color will love these! Thank you so much! Since my molds are a little smaller, I’m thinking of putting two hearts on the cards. Thanks for this great idea! 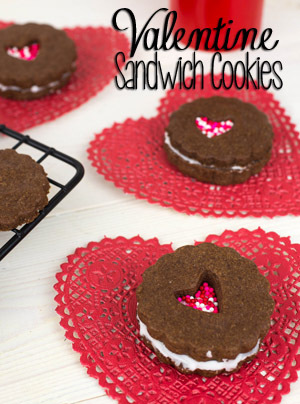 We tried these yesterday and they turned out great, thank you for the post! I love the colors and the cute heart shapes. Do you have any suggestions for cleaning the remaining crayon residue from the mold? Hi Gaby! I’m glad they turned out great! Our mold still has residue in it, too. Unfortunately, I’m not really sure what could take the residue out. I’ll just be using our mold for crafts from now on, since I don’t really trust it for food, haha! Sorry I couldn’t be more help. Try placing the mold tray in the freezer. That is my goal after trying this project out with my four year old princess. I just came upon this craft and I am absolutely in love and cannot WAIT to try it with my kids! I’m thinking you know how if you want to remove hardened candle residue from candle holders you place it in the freezer? Maybe this can work to remove the crayon residue? Worth a try! Suggestion for getting crayon wrappers off: soak them in a bowl of water for a few minutes. Easy, breezy! I am so excited to do this with my 4yr old for his classmates!! May I please ask where you got the molds from? And did the indentation form in the center of the heart by itself or did you do a thumbprint. .. also.. one last question is the paper folded over so they can open and draw more? Hi Stacy! I used this mold from Amazon: http://www.amazon.com/gp/product/B004GGCS2W/ref=as_li_ss_tl?ie=UTF8&camp=1789&creative=390957&creativeASIN=B004GGCS2W&linkCode=as2&tag=theswi0e-20 — It has the heart indentation already in it! I did not fold the paper over, but you could totally do that to give the kids more room to color. I love that idea! These are adorable! 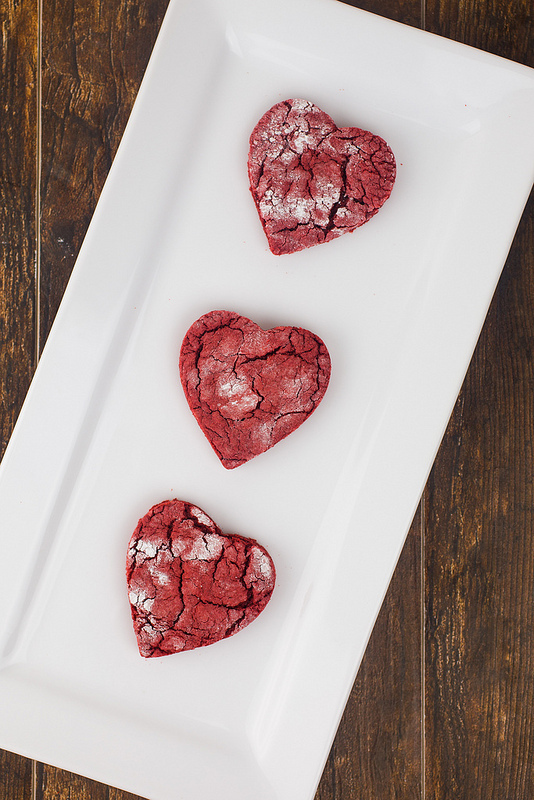 Do you have to use a silicone mold or can old muffin pans work? I see you have posted that you used 60-75 crayons…..how many did that make? Was that only the 12 in that mold? I need to make 24 so I want to make sure I have enough! Thank you! Yes, that made only the 12 crayons. Hope that helps! 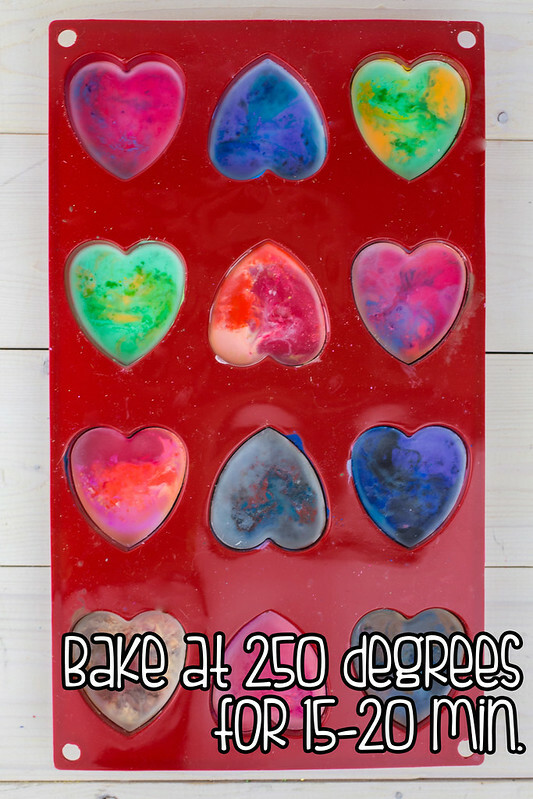 This is such a beautiful and fantastic idea for a class Valentine’s Day gift. 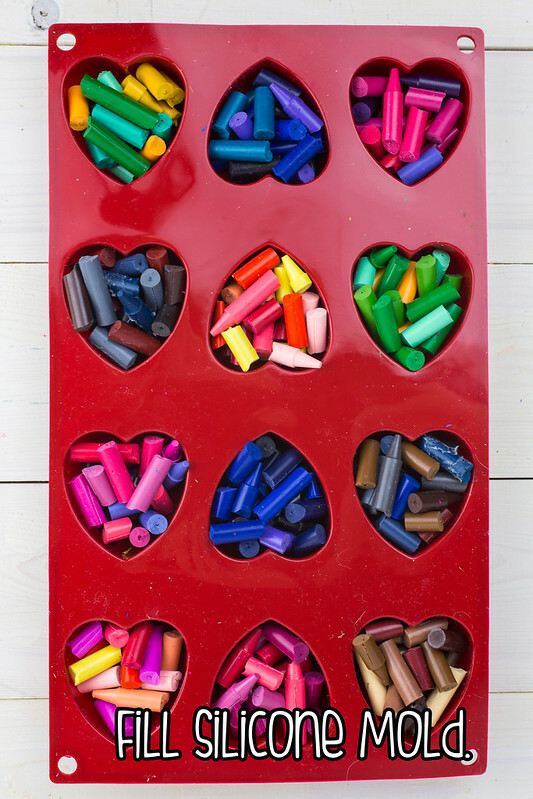 We have a ton of broken crayons at our home, and this would be a great way to reuse them. 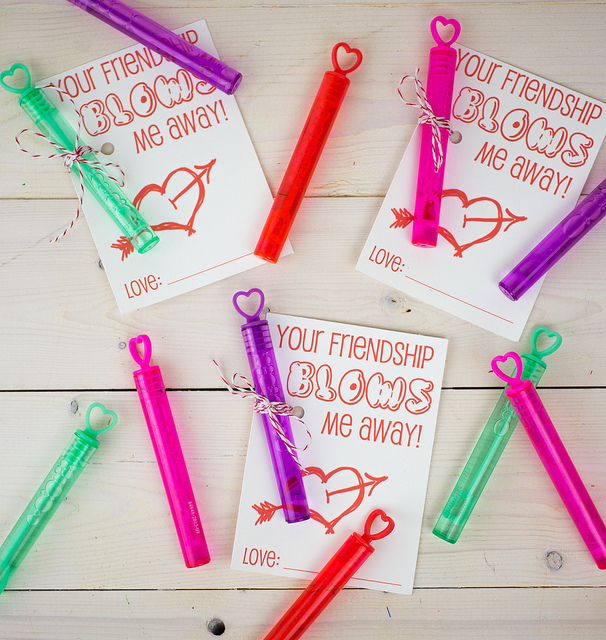 My kids will love this activity and will love to give these special Valentines out to their friends. Thank you so much! Will all those crayons only make 12? The link to the printable is not working. 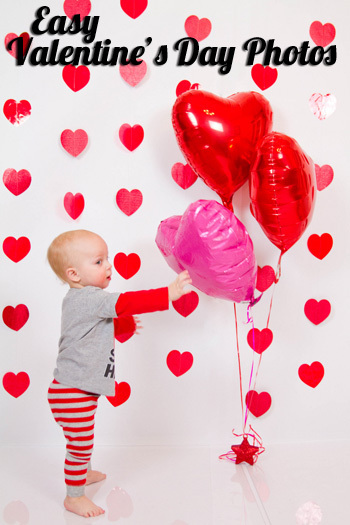 I LOVE this idea – so adorable! We are thinking about making these as a service project to give out to patients at a local children’s hospital. My question is – do you have to use Crayola crayons or can an off brand work too? I am a teacher. 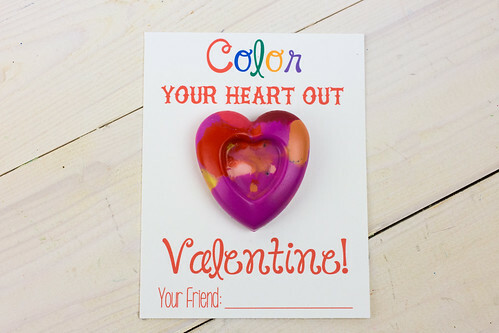 Can you change the printable so that instead of “your friend” at the bottom, it just says “Love _____________” So I can make these for my students and sign my name? Hi! 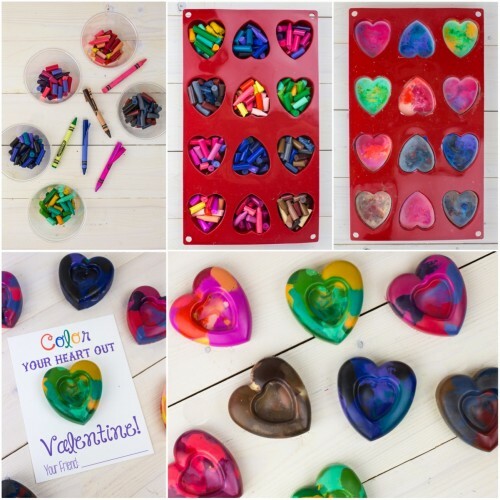 I am planning on doing this for my daughter’s kindergarten class and wondered how you or anyone else delivered them to the school and the the other kids’ valentine boxes? Envelope? Little cloth bag? Little ziplock bag? Thanks! I was really hoping somebody would answer this by now. Ziploc is a good idea, I didn’t think of that. I was thinking may be ‘sheet protectors without holes’ or even ‘job ticket holders’. If anyone has a better idea, please share. I used glue to hold them to the cards and just sent them that way. 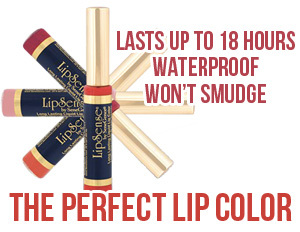 You could put them in small ziplock bags if you are worried about the crayon coming off. Hope that helps! 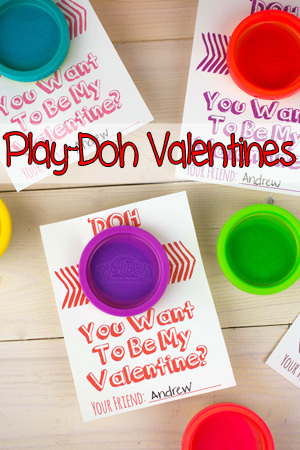 I just used your directions and free printable for my 2 year olds Valentines. Thanks, these are so cute! 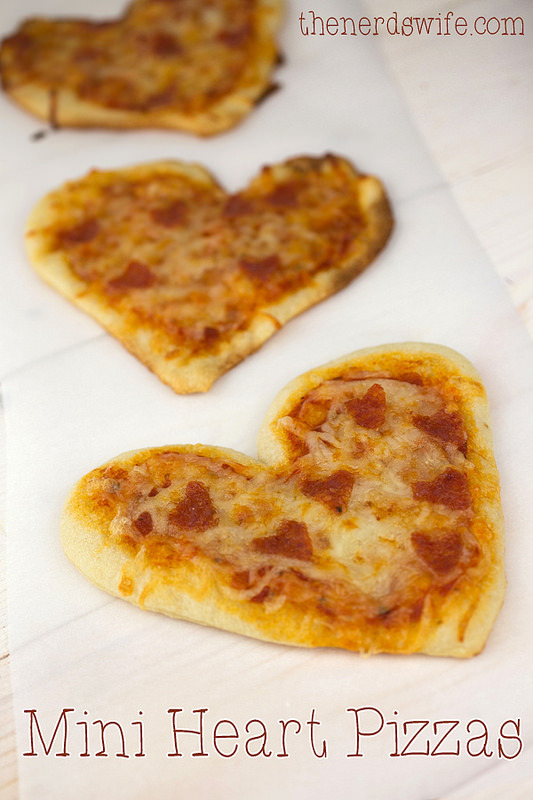 Hi, I can’t wait to make these with my kids this weekend! Do I have to use crayola or will other crayons work too? Thanks! my hot glue didnt work so well either it was melting the crayons so I had to let the hot glue cool some before sticking the crayon to it worked most of the time. They turned out wonderful, however, I’m kicking myself for not reading the comment section before starting. Unwrapping the crayons took forever and my 3 year old lost interest. I ended up using a utility knife to get most of the paper glue off. I also wish I would have used colored cardstock to make the print out a bit more festive. I totally forgot to add scents. I made 48, so I was at it for awhile. In the future I would mix the colors up more, it looks more tye dye-like that way. Hi! 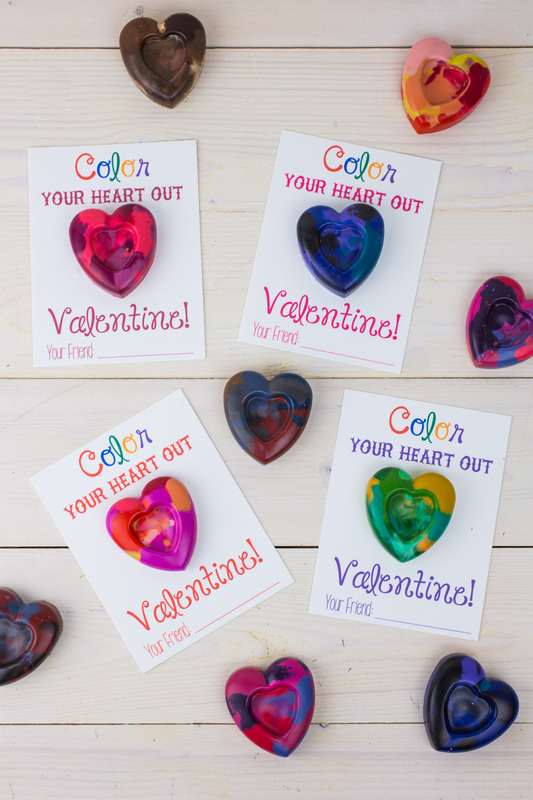 This is my second year making your heart-shape crayon Valentines– they are SO cute, and perfect for several ages/grades. I have a tip for attaching the crayon to the cardstock: use basic duct tape and make a little loop (sticky side facing out) to attach the back of the crayon to the card. Last year I struggled to make them stick– hot glue didn’t work for me. This year, duct tape worked like a charm! And, as some commenters previously mentioned, a quick soak in water for the crayons will help you remove the paper wrappers. Why does it come out as “Colour” instead of “Color” when I click the link to print? Hi! Just wanted to say that I tried making these for the first time last night and they turned out beautifully! I used silicon moulds I bought at the dollar store. 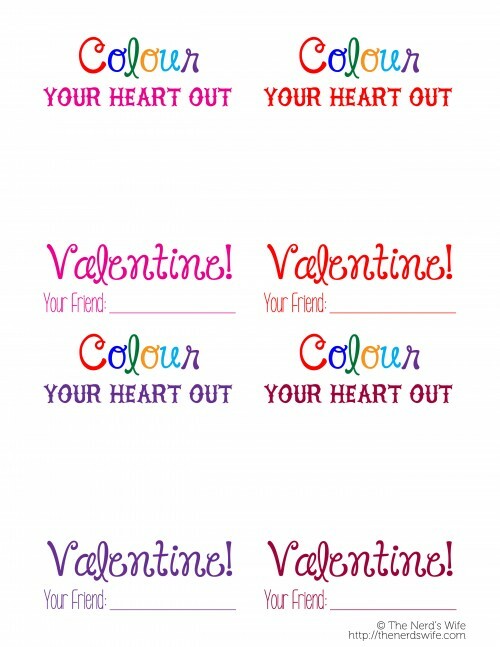 And thank you for the free printables (especially including ones with “colour” – as I’m Canadian). Going to be making these every ear now! 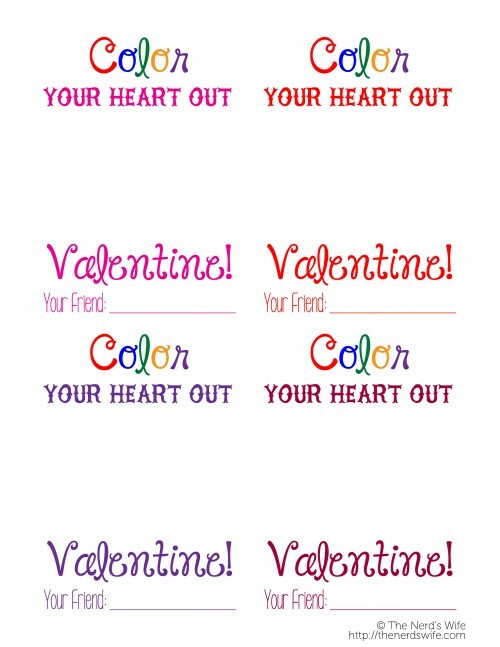 I am trying to print out the free heart shaped valentines with “color” and every time I click on that image, the “colour” one shows up! I am trying to print the out but keep getting the international version. Is there a way to get the one that says “color”? Question about melting the crayons: I put them in the oven at 250 degrees for 20 min and they barely melted at all. Any tips on if I should turn the heat up or just wait longer? I did buy crayons from the dollar store so maybe their consistency is different than what you used? Thanks for any help! Such a cute idea! I’m a mom who hates to throw away anything. So, this is a project with my granddaughters, made from the broken crayon pieces from their parents crayons. I’m loving using up all these old broken crayons! Oh, and all the remaining leftovers are turning into new sets of 8 crayons to go in our church craft sale. Thank you for creative ideas.